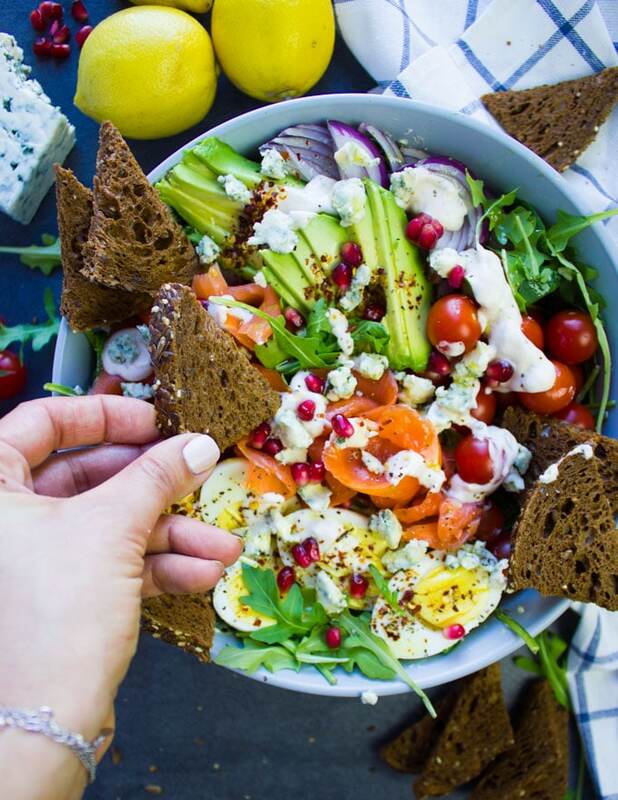 When you’re craving smoked salmon and tired of old fashioned smoked salmon recipes, try this delicious Smoked Salmon Salad With Blue Cheese Dressing. It packs plenty of flavors and textures, a dash of fancy and gourmet, and lots of deliciousness! 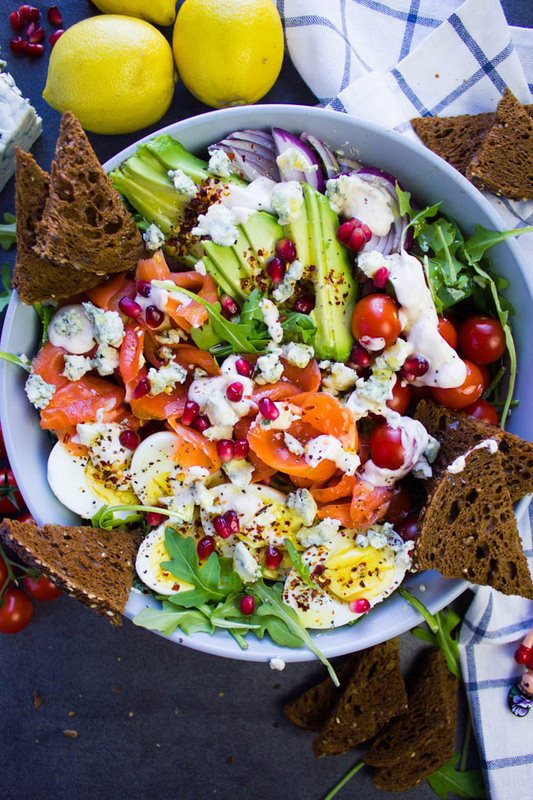 I’m super excited to share this smoked salmon salad with you. It brings back lots of memories and stories from when I was engaged. See I wasn’t ever a blue cheese dressing person, and even more, I wasn’t a hard boiled egg in a salad person either! It feels like a smoked salmon appetizer, only eaten in a bowl. So it could be the best way to start any meal, or a meal on its own. If you’re making this for a party, it’s best to serve it on a flat platter and arrange ingredients in a way that each can mix and match their own. I think this would probably be my favorite smoked salmon appetizer! 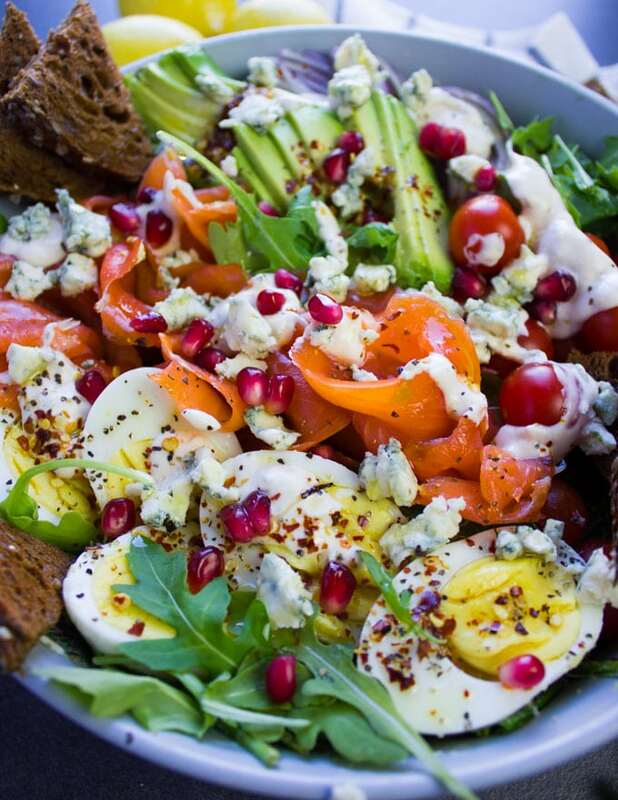 Imagine a combo of smoked salmon, greens, creamy avocados, tomatoes, red onions and hard boiled eggs. Super hearty and filling. The blue cheese dressing. I have to mention that my hubby used to devour blue cheese while I cringed. I started to force myself into it and this dressing was how it all began! You’ve probably had blue cheese salad dressings loaded with mayo and oil. This is NOTHING like that! More on the dressing later! Croutons, because we can’t have salad with croutons. These are Pumpernickel Rye croutons. The absolutely best bread to pair with smoked salmon. This is the first step to fall in love with blue cheese. A creamy dreamy, garlicky dressing with a hint of blue cheese. The beauty of this dressing is the hint of blue cheese is totally optional to be faint or strong. Start off with faint and go all the way up! Most dressings start with mayo, however my favorite blue cheese salad dressing starts with sour cream. It’s creamier and lighter in taste/feel. Low fat sour cream or Greek yogurt similarly work great here for a low fat option. The rest of the ingredients are: garlic, salt, pepper, a dash of hot sauce (optional) and some lemon juice. Once you get all of these mixed up, it’s time for the blue cheese crumbles. Like I said, go easy or hard on the blue cheese. It’s totally your taste. 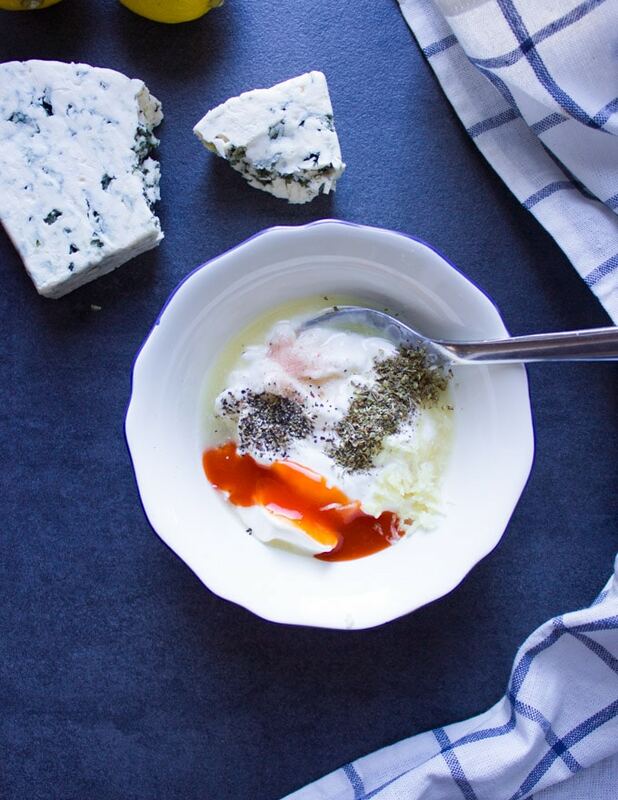 If you’re already a blue cheese lover, go for about 2 paced tablespoons like I do. Finally, mix all of that together and it’s ready to use! Make plenty of this blue cheese dressing because it keeps well in the fridge. And I can assure you, you’ll need it! 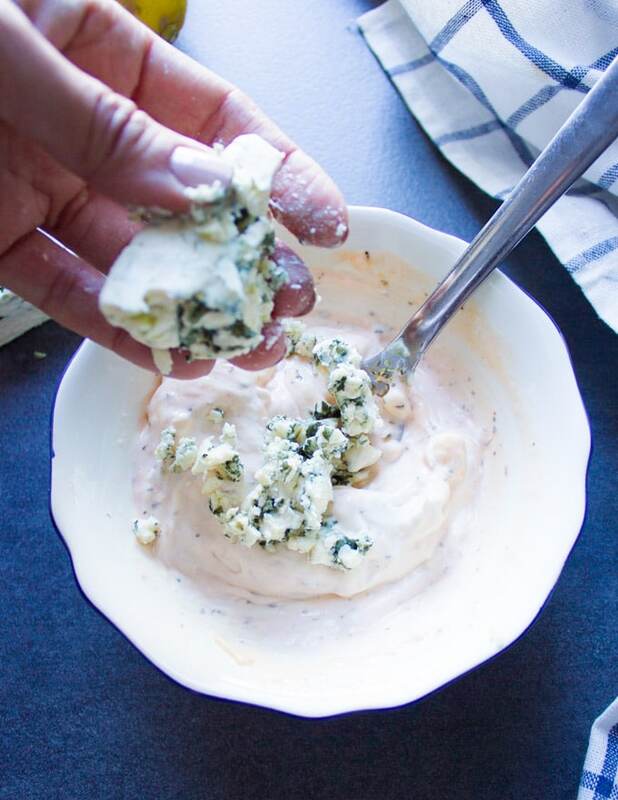 Some ways to use a blue cheese dressing other than salads are: spread it over your sandwiches, use it as a blue cheese dip, top it over grilled steak, chicken and more! First of all, start with your choice of greens or mixed greens. Today I chose spinach and a touch of arugula. Any type of green or lettuce works great here. 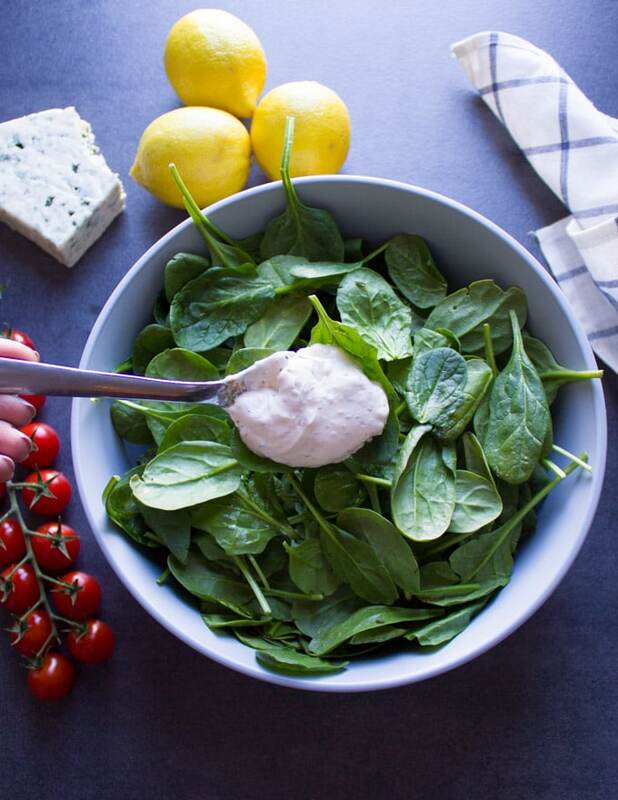 First tip is to toss your greens with a tablespoon of blue cheese dressing before adding the rest of your ingredients. This adds so much flavor so PLEASE don’t skimp! 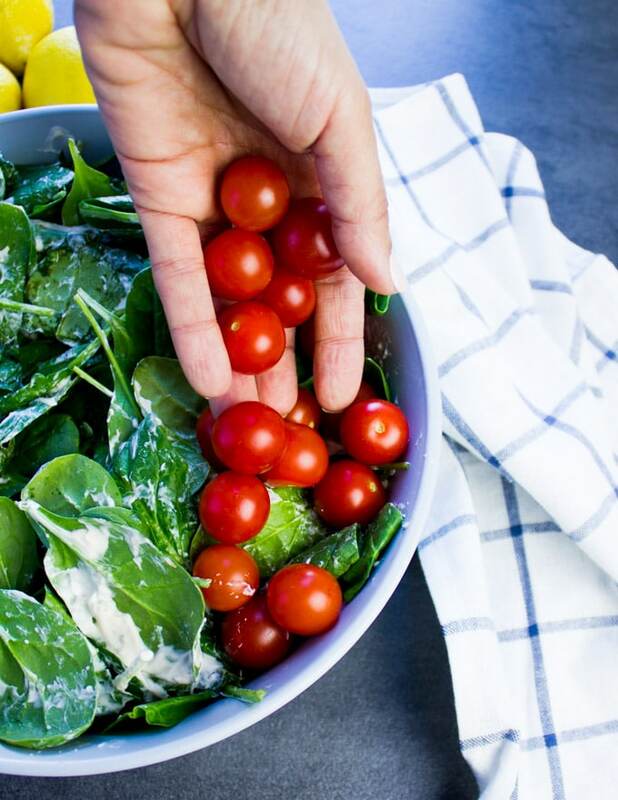 Now add your salad ingredients over the dressed up greens. The sky’s your limit. 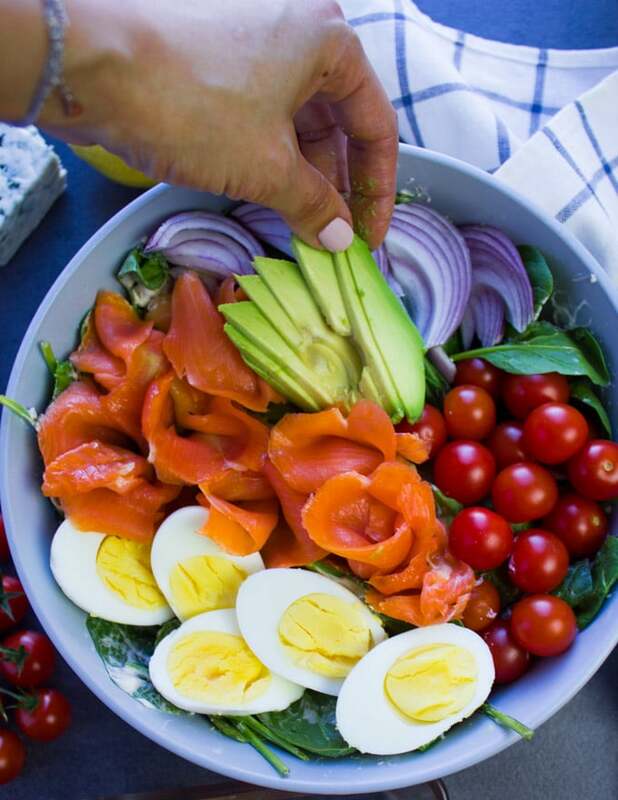 I added cherry tomatoes, sliced avocados, hard boiled eggs, sliced red onions and my cold smoked salmon. I love curling/rolling the smoked salmon to look like roses. Finish off the salad with a drizzle here and there of the blue cheese dressing, some more blue cheese crumbles and sweet pomegranate arils. 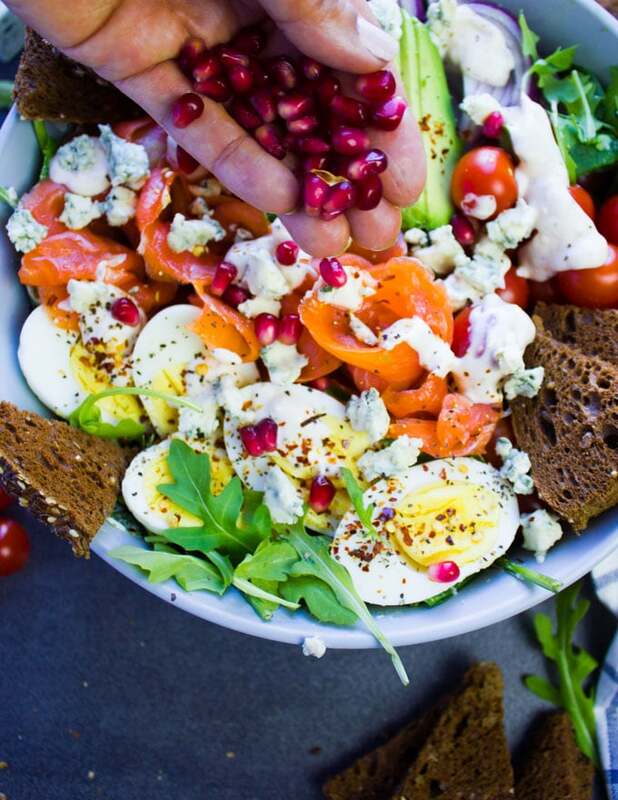 The pomegranate just add a touch of sweet and color to your smoked salmon salad. Croutons: Cut your pumpernickel slices into squares and each square into two triangles. Bruch the top with olive oil or melted butter and sprinkle a dash of salt, then toast the croutons on a baking sheet for 8 minutes. Use cold smoked salmon for tastiest salad. Make your Blue cheese dressing ahead of time. Pick your ingredients and chop, slice and prep ahead of time. 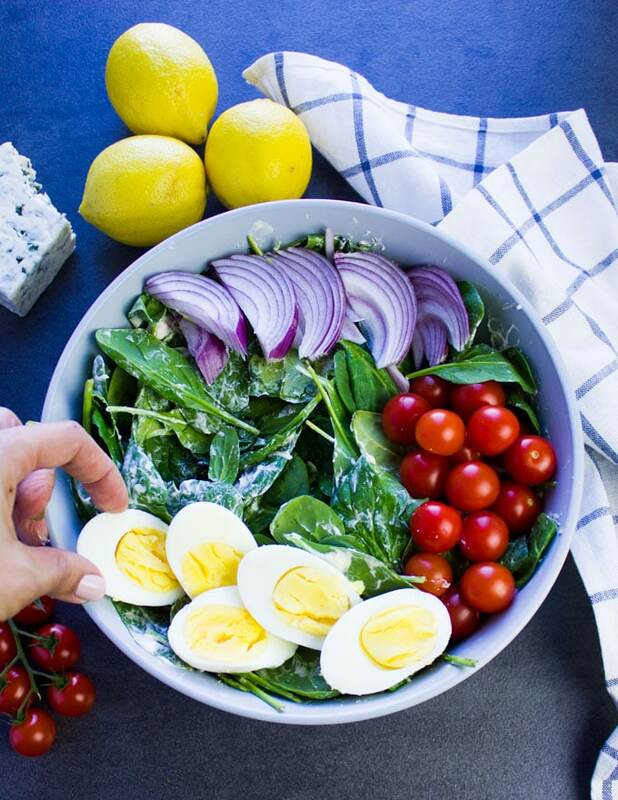 Dress the greens separately as the base of your salad and then drizzle dressing over the other ingredients without tossing. Croutons are optional and you can swap the type of bread. 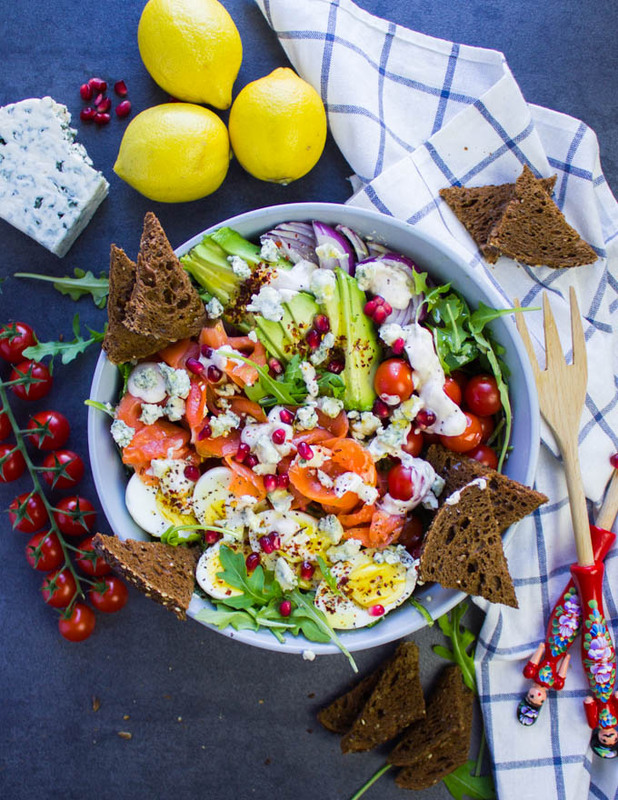 Smoked Salmon salad can be prepared 2 days in advance and left overs make a great sandwich, bagel or lunch the next day! Easy Smoked Salmon Platter this is a no brainer spread for last minute brunch/breakfast! That same spread makes the best Smoked Salmon Breakfast Bagel. Another MUST try combo for blue cheese and salmon is ultimately this Seared Salmon with Blue Cheese. 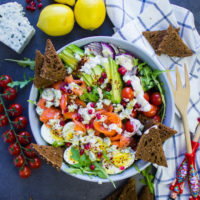 When you're craving smoked salmon and tired of old fashioned smoked salmon recipes, try this delicious Smoked Salmon Salad With Blue Cheese Dressing. It packs plenty of flavors and textures, a dash of fancy and gourmet, and lots of deliciousness! Mix all ingredients together without the blue cheese and adjust seasoning if you prefer. Then add in the blue cheese and smash it in while mixing it. Prepare all ingredients and start by adding the greens at the bottom. Toss the greens with a tablespoon if the dressing for maximum flavor and then start piling up the rest. Fold over your smoked salmon to look like roses and start arranging them over the greens and surround them by all ingredients. Drizzle an extra 1-2 Tablespoons of the blue cheese dressing over the salad and sprinkle extra crumbled blue cheese if you like. preheat your oven to 375 F. Cut your pumpernickel slices and season it. Drizzle the oil over it and spread them on a single layer and toast for 8 minutes. this is the salad for non salad lovers like myself. even i couldn’t help but to fall in love with all the amazing flavors going on here. what a perfect salad! Oh you need to hop on the salad wagon! 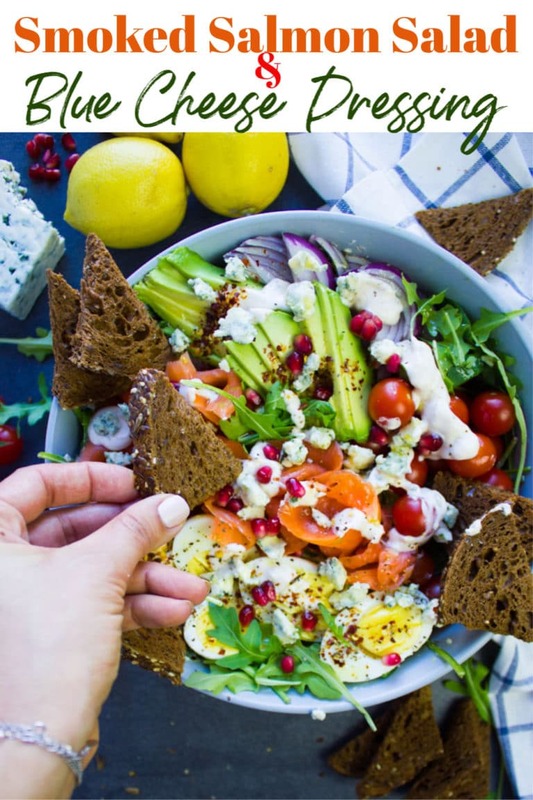 This salad looks absolutely gorgeous and so filling. I am so trying your Blue cheese dressing for sure! Love the heat you added to it!! Oh my goodness does this look amazing! I love smoked salmon and blue cheese- together it sounds so tasty. I am excited to try the hot sauce in the blue cheese dressing. I have not had it that way before and it sounds really good. I’ve been on a smoked salmon kick lately, adding it to everything. I also adore bleu cheese so I would absolutely love this salad. So much flavor with fresh ingredients! Hope this makes your table soon! This salad was so delicious, I love smoked salmon! Hope you try it Steph! That salad looks absolutely delicious. Oh my goodness that blue cheese dressing is terrific. I could eat a big bowl os this salad right now. It’s all about the dressing! Looks so festive and fabulous! I would love to try this, so tasty and flavorful! 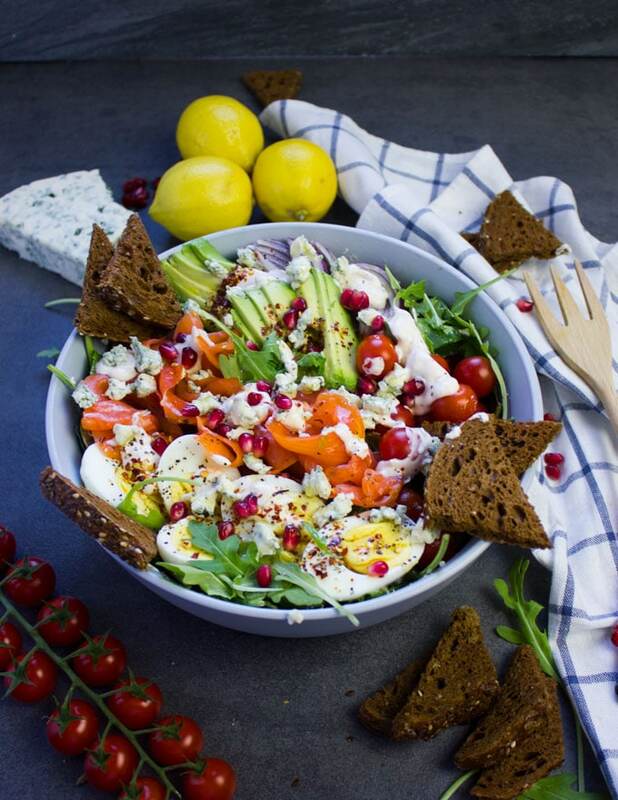 This salad looks incredible!! Love the fresh pomegranates on top! I bet this tastes amazing, but it truly is stunning to look at also! Gorgeous colours! What a pretty and delicious salad! I love smoked salmon, and this seems like such a hearty dish for a great meal! 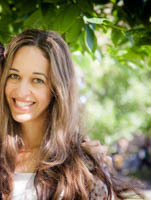 Patricia, thank you! Hope you make it!